Many engine failures are related to the cooling system. Problems such as overheating, water pump leaking, plugged radiators, and cylinder liner pitting can be avoided with proper cooling system maintenance. Cooling system maintenance is as important as fuel and lubricating system maintenance. Coolant quality is as important as the quality of fuel and lubricating oil. Distilled or deionized water is recommended for use in engine cooling systems. DO NOT use hard tap water or salt softened tap water in engine cooling systems. If distilled or deionized water is not available, use water that meets the minimum acceptable requirements listed in the following chart. Additives must be added to all coolant mixtures. Additives help prevent the formation of rust, scale, and mineral deposits. Additives protect metals from corrosion, prevent liner cavitation, and contain antifoaming agents. Additives deplete during engine operation and need to be replenished. This can be done by treating conventional coolants with Supplemental Coolant Additives (SCA) or by treating Extended Life Coolant (ELC) with Extender. Additives must be added at the proper concentration. Overconcentration of additives can cause the inhibitors to drop out of the solution and form a gel in the radiator. An overconcentration of additives produces excessive deposits on water pump seals that can cause the water pump seal to leak. Underconcentration of additives can produce pitting, cavitation, erosion, rust, scale, and foaming. Glycol in the coolant provides boil and freeze protection, prevents water pump cavitation, and reduces cylinder liner pitting. For optimum performance, Caterpillar recommends a 50/50 glycol/water coolant mixture. NOTE: All Caterpillar engines equipped with air-to-air aftercooling (ATAAC) require a MINIMUM of 30 percent glycol to prevent water pump cavitation. Ethylene glycol is used in most conventional heavy duty (HD) coolant/antifreezes. However, propylene glycol may also be used. Both ethylene glycol and propylene glycol have similar fluid properties in a 50/50 glycol/water mixture. Both ethylene glycol and propylene glycol provide similar heat transfer, freeze protection, corrosion control, and seal compatibility. The following charts define the temperature protection provided by the two types of glycol. Caterpillar recommends the use of a refractometer for checking the glycol concentration. Use the 1U-7298 Coolant Tester (°C) or use the 1U-7297 Coolant Tester (°F). The testers give immediate, accurate readings and can be used with ethylene or propylene glycol. Caterpillar ELC will provide the best coolant service life, corrosion protection, water pump seal service life, and radiator service life. Caterpillar recommends a 50/50 glycol/water mixture for optimum coolant/antifreeze performance. NOTE: Caterpillar DEAC and commercial heavy duty (HD) coolant/antifreezes meeting the TMC RP329 specification do not require SCA treatment at initial fill. Commercial HD coolant/antifreezes meeting the ASTM D5345 or D4985 specification DO REQUIRE SCA treatment at initial fill. Caterpillar provides Extended Life Coolant (ELC) for use in heavy duty diesel engines, natural gas engines, and automotive engines. The Caterpillar ELC anticorrosion package is totally different from conventional coolants. Caterpillar ELC is an ethylene glycol based coolant which contains organic acid corrosion inhibitors and antifoaming agents. Caterpillar ELC has fewer nitrites than other coolants. Caterpillar ELC has been formulated with the correct levels of additives to provide superior corrosion protection for all metals in diesel engine cooling systems. Caterpillar ELC extends coolant service life to 966 000 km (600,000 mi) or Six Years. Caterpillar ELC does not require frequent additions of SCA. A “one time only” coolant Extender is the only maintenance addition required. The Extender should be added to the cooling system at 483 000 km (300,000 mi), or one half of the ELC service life. Caterpillar ELC is available Premixed with distilled water in a 50/50concentration. The Premixed ELC provides freeze protection to -36°C (-33°F). The Premixed ELC is recommended for initial fill and for topping off the cooling system. ELC Concentrate is available to lower the freezing point to -51°C (-60°F) for Arctic conditions. ELC Concentrate should be used to adjust the coolant freeze point as required where Caterpillar ELC Premixed freeze protection is not acceptable. Consult your Caterpillar dealer for part numbers and available container sizes. NOTE: The Caterpillar EC-1 Specification is an industry standard developed by Caterpillar. The EC-1 specification defines all of the performance requirements that an engine coolant must meet in order to be sold as an extended life coolant for Caterpillar engines. Caterpillar ELC can be used in most OEM diesel, gasoline, and natural gas engines. Caterpillar ELC meets the industry performance requirements of ASTM D4985 and D5345 for heavy duty low silicate coolant/antifreezes. Caterpillar ELC also meets the industry performance requirements of ASTM D3306 and D4656 for automotive applications. Caterpillar ELC Extender is added to the cooling system halfway through the ELC service life. The cooling system should be treated with Extender at 483 000 km (300,000 miles) or one half of the ELC service life. Use the chart below to determine the proper amount of Caterpillar Extender required. NOTE: CLEAN WATER is the only system cleaning/flushing agent required when ELC is drained from the cooling system. ELC can be recycled. The drained coolant mixture can be & “distilled” to remove the ethylene glycol and water for reuse. Consult your Caterpillar dealer for more information. After draining and refilling the cooling system, operate the engine with the radiator filler cap removed until the coolant reaches normal operating temperature and the coolant level stabilizes. Add ELC mixture as necessary to fill the system to the proper level. 2.Flush the system with clean water to remove any debris. 3.Clean the cooling system with Caterpillar Cooling System Cleaner. Follow the instructions on the label. 4.Flush the cooling system with clean water. It is very important to remove all of the cleaning agent. 5.Fill the cooling system with clean water. Operate the engine until the cooling system temperature is 49 to 66°C (120 to 150°F). 6.Drain the cooling system. Flush the cooling system with clean water. 7.Repeat steps 5 and 6. Continue to flush the cooling system with clean water until the draining water is also clean. 8.Fill the cooling system with Caterpillar ELC. 9.Attach a label to the cooling system to indicate the system has been switched over to Caterpillar ELC. * Drain the cooling system. Flush the system with clean water. Refill the system with ELC. * Maintain the cooling system as if the system is filled with conventional HD coolant/antifreeze. If Caterpillar extended life coolant is not used, select a commercial extended life coolant that meets the Caterpillar EC-1 specification. Do not use a product that is labeled as an extended life coolant but does not meet the Caterpillar EC-1 specification. Follow the coolant maintenance guidelines of the commercial ELC supplier. In all cases, use distilled or deionized water or use water that has the properties listed in the Caterpillar Water Quality Limits chart and follow the Caterpillar recommendations for the coolant change interval. Caterpillar recommends the use of Caterpillar Diesel Engine Antifreeze/Coolant (DEAC) in conventional HD cooling systems. DEAC is an alkaline type, single phase, ethylene glycol based antifreeze/coolant. DEAC contains inorganic corrosion inhibitors and antifoaming agents. Caterpillar DEAC is available premixed with distilled water in a 50/50concentration. If DEAC concentrate is used, Caterpillar recommends mixing the concentrate with distilled or deionized water. If distilled or deionized water is not available, use water that has the properties listed in the Caterpillar Water Quality Limits chart. Caterpillar Supplemental Coolant Additive (SCA) is effective in preventing corrosion on all metals. Caterpillar SCA also prevents the formation of mineral deposits, prevents liner cavitation, and eliminates coolant foaming. Caterpillar DEAC is formulated with the correct level of Caterpillar SCA. Additional SCA is NOT needed when the cooling system is initially filled with DEAC. If Caterpillar DEAC is not used, select a low silicate commercial HD coolant/antifreeze that meets TMC RP329 or ASTM D5345 or D4985 specifications. When a commercial HD coolant/antifreeze is used, the cooling system should be treated with three to six percent Caterpillar SCA by volume. 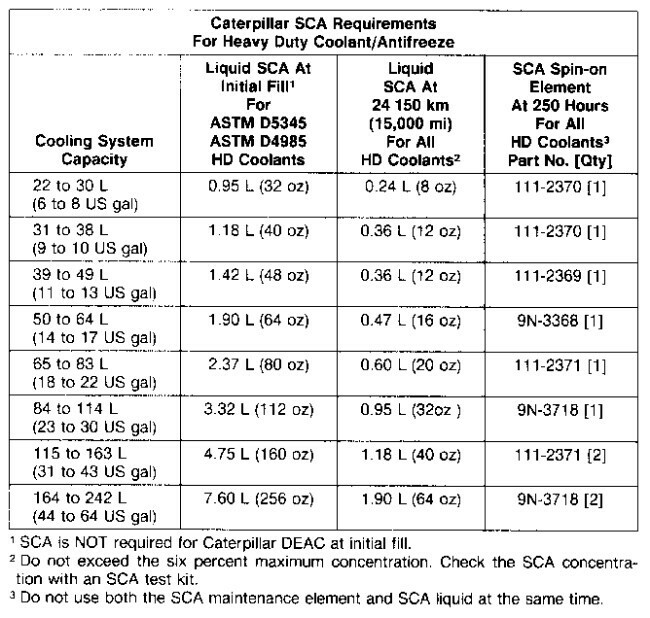 Refer to the Caterpillar SCA Requirements for Heavy Duty Coolant/Antifreeze chart. If Caterpillar SCA is not used, select a commercial SCA. The commercial SCA must provide a minimum of 1200 mg/L or 1200 ppm (70 grains/US gal) nitrites in the final coolant mixture. Follow the coolant maintenance guidelines of the commercial SCA supplier. In all cases, used distilled or deionized water or use water that has the properties listed in the Caterpillar Water Quality Limits chart. HD coolant/antifreezes that meet ASTM D5345 or D4985 specifications DO require SCA treatment at initial fill, and on a maintenance basis. HD coolant/antifreezes that meet TMC RP329 specifications DO NOT require SCA treatment at initial fill, but SCA treatment is required on a maintenance basis. Check the coolant/antifreeze solution (glycol content) frequently to ensure adequate boil and freeze protection. Caterpillar recommends the use of a refractometer for checking the glycol concentration. Use the 1U-7298 Coolant Tester (°C) or use the 1U-7297 Coolant Tester (°F). The testers give immediate, accurate readings and can be used with ethylene or propylene glycol. Caterpillar on-highway diesel engine cooling systems should have the SCA concentration tested every 24 150 km (15,000 miles). Your Caterpillar dealer has test kits to evaluate SCA concentration. Test the SCA concentration or submit a coolant sample to your Caterpillar dealer (refer to the S·O·S Coolant Analysis topic). SCA additions are based on the test results or based on the coolant analysis results. Liquid SCA or a SCA maintenance element (if equipped) may be needed every 24 150 km (15,000 miles). The following chart lists the amount of Caterpillar SCA needed at initial fill to treat commercial HD coolant/antifreezes meeting ASTM D5345 or D4985 specifications. The chart also lists SCA additions for liquid SCA and for SCA maintenance elements at 24 150 km (15,000 miles). The additions apply to all types of HD coolant/antifreezes. The following chart lists part numbers and quantities for Caterpillar SCA. NOTE: Due to specific engine applications, maintenance practices may need periodic evaluation in order to properly maintain the engine’s cooling system. Caterpillar Cooling System Cleaners are designed to clean the cooling system of harmful scale and corrosion. Caterpillar cleaners dissolve mineral scale, corrosion products, light oil contamination, and sludge.